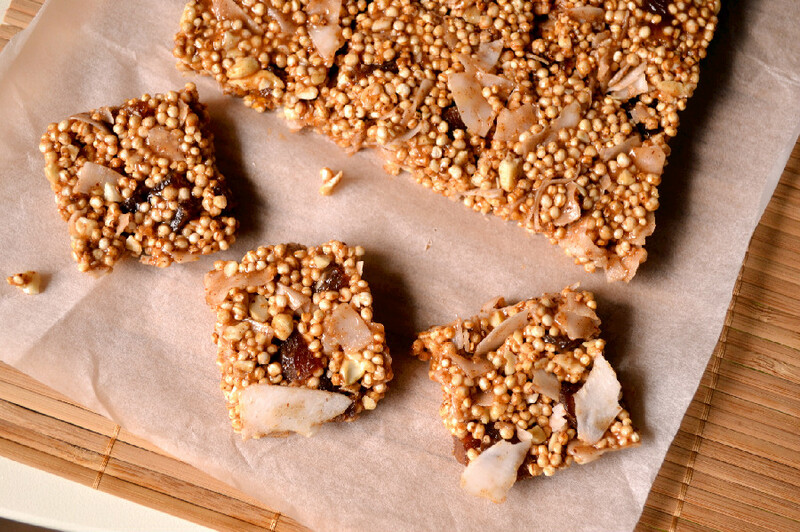 I always keep some homemade granola bars or puffed grain treats on hand for two reasons. They make a great snack in between meals and they’re portable, so I can wrap them up, throw them in my bag and I have a snack in an instant, which keeps me away from the junk out there. I’ve been making varying versions of them for over a year and I don’t think I’ve made the exact same recipe twice. I’m always changing up the puffed grain and flavour combinations based on what’s in my pantry at the moment. I’ve recently started the habit of writing all the variations down so I can reproduce or share the recipes with you. The latest version was made with Mama in mind. She’s a huge fan of coconut and I wanted to make her a nice snack during her visit here. It’s the least I could do after putting her to work on some delicious home cooked Lebanese food. With only 6 ingredients, and no baking required, you can whip these up and enjoy them in 10 minutes flat. The combination of brown rice syrup, nut butter, coconut chips, dried apricots, vanilla and cashews makes these really sweet and decadent with a good dose of healthy fats. I purposely made them on the thin side, because one small bite is all you need, but if you prefer a thicker square you can always double the recipe or use a smaller pan. These puffed quinoa squares are a perfect afternoon treat when you’re in the mood for something sweet. They’re refined sugar free and sweetened with brown rice syrup and dried apricots so they won’t send your blood sugar on a wild ride. Guilt free snacking never tasted so good. Combine puffed quinoa, coconut, apricots, vanilla and crushed cashew pieces in a large mixing bowl. In a small pot, whisk together nut butter and brown rice syrup until combined and liquified. Pour liquid over dry quinoa mixture and stir until the mixture sticks together. Press firmly into a parchment paper lined dish (I used an 11×7 glass baking dish), to 1 inch thickness, using your hands, a spatula or a piece of parchment paper and a pastry small rolling pin to flatten out the top. Using a sharp knife, slice the slab into as many squares or bars as you like, and let set about 30 minutes. Remove from the dish and separate the squares. Store in an airtight container in the refrigerator or at room temperature in a cool dry place, for up to 5 days. These look wonderful! 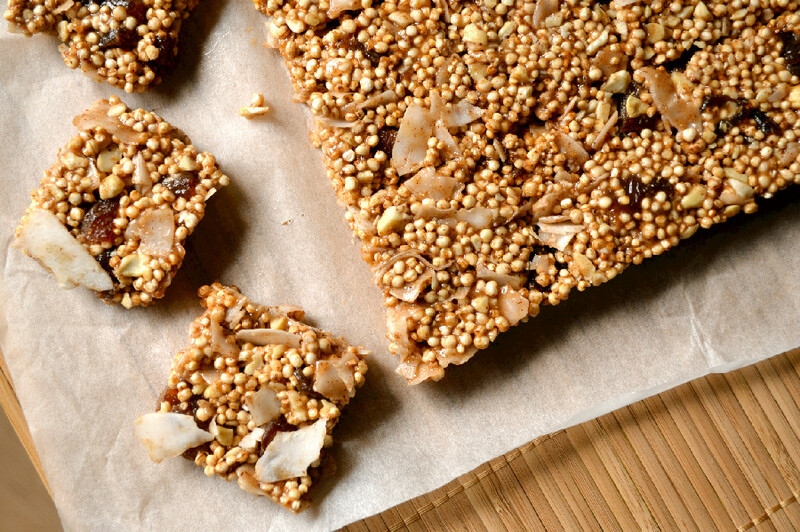 Love the coconut in them….I haven’t tried the puffed quinoa yet…have never seen them before. I do however have quinoa flakes that I use in granola bars! Thanks honey! I never saw Quinoa puffs when I lived in Canada, not even at Whole Foods, but I’m not sure if they have them now. I found this with a quick Google search though http://www.livingtreecommunity.com/store2/product.asp?id=245&catid=21…can’t vouch for the manufacturer or brand as I’ve never used it, but looks like they have quinoa puffs. You could also use millet or rice puffs. I used to use a brand called Nature’s Path in Canada. Amaranth puffs would be tasty too, but you may need to play with the wet dry ratio there since they’re tinier. What a great idea! These look so wonderful- thanks for sharing! Thanks darling, I’m glad you like them.